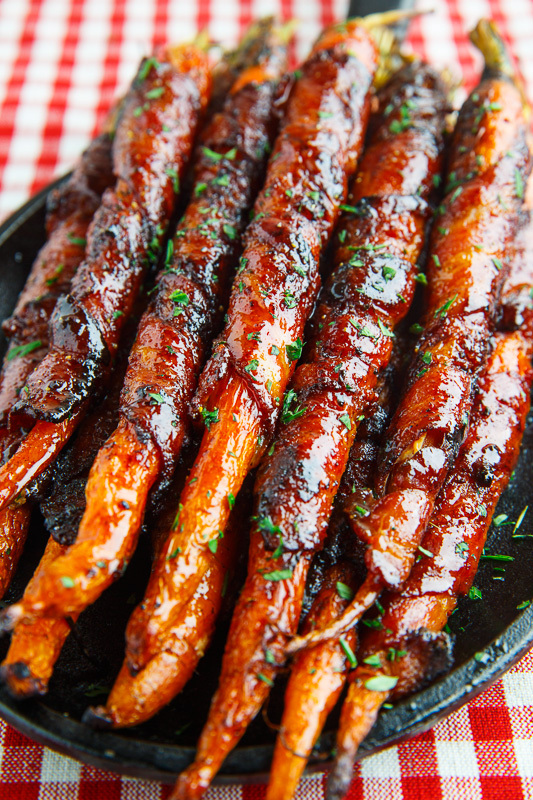 Crispy and salty bacon wrapped roasted carrots glazed in sweet maple syrup that are the perfect side dish for any meal! Are you looking for a tasty side dish for an important meal? Boy do I have one for you! 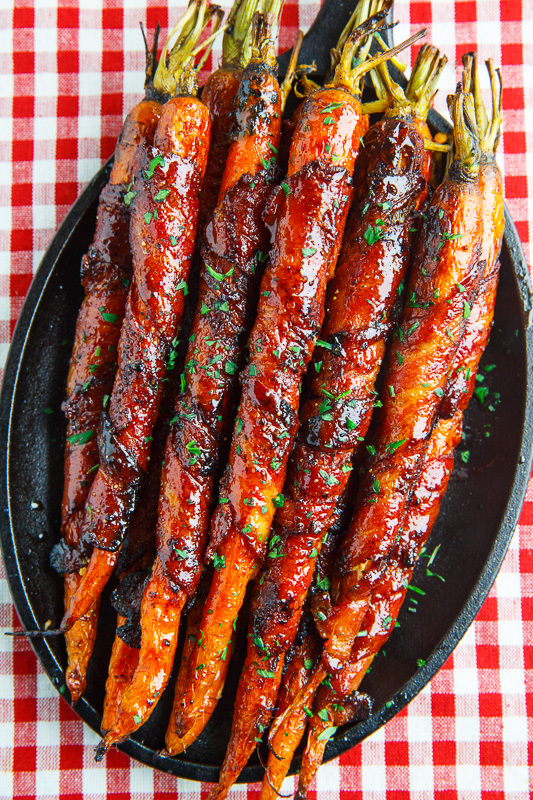 These maple glazed bacon wrapped roasted carrots are super easy to make and oh so good! The sweet and salty combo of the sweet roasted carrots and maple syrup and the salty bacon wrapping is simply divine! 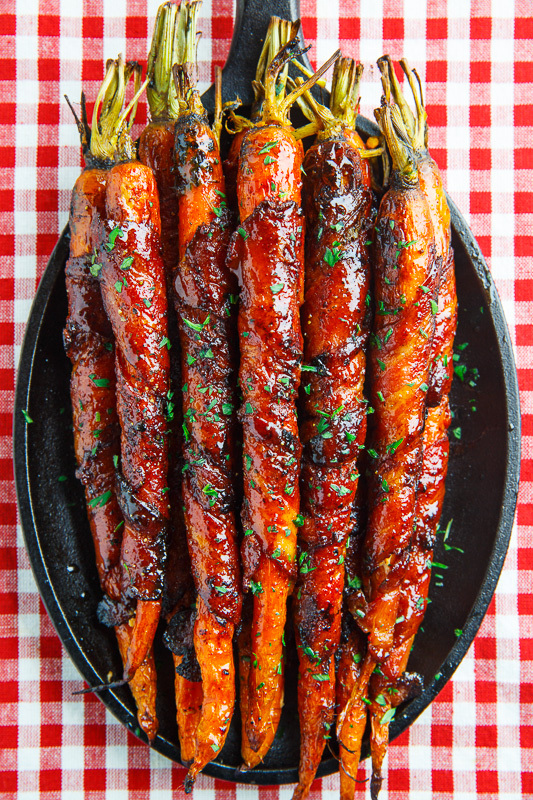 Not only are they my current favourite side dish but these maple glazed bacon wrapped roasted carrots are so easy to make, you just wrap the carrots up in bacon and roast them until the bacon is crispy and the carrots are nice and tender, glazing them with maple syrup as they roast! If you are making a large dinner where oven space and time is limited, like mine often is, you can also ‘roast’ them in a skillet! 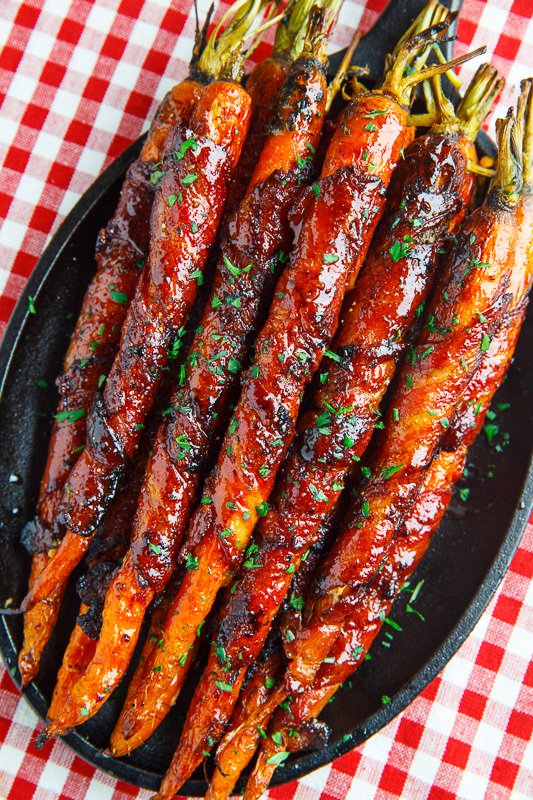 So if you are looking for an easy and tasty side dish that is sure to leave every one at the table talking about it, these maple glazed bacon wrapped roasted carrots are just the thing! Arrange on a wire rack on a baking sheet and roast in a preheated 400F/200C oven until the bacon is crispy and the carrots are tender, about 20-30 minutes, glazing with the maple syrup half way through. OR Roast/fry the bacon wrapped carrots in a skillet over medium heat until the bacon is crispy and the carrots are tender, about 20-30 minutes, glazing with the maple syrup half way through. Option: Mix some Dijon mustard into the maple syrup. Option: Use pre-cooked bacon or precook the bacon the bacon to the point where it is still easily wrapped but a lot of the fat has cooked out. Quanto sono ghiotte queste carote, che meraviglia!!!! Even though I am already a subscriber, can I still get the cookbook? Kevin…at the end of the recipes you have the nutrients..but not an amount. Is the calorie count and such for the whole 2 lbs of carrots and bacon or for how many? and I love everything you do! What a brilliant idea! Definitely doing this for Thanksgiving! Thanks for the recipe! Kevin….you list 328 carbs for this dish…even for the ENTIRE dish, that's way more than could possible be in it for the ingredients listed? The maple syrup only adds 8.67 carbs per serving? One medium Carrot has 6 carbs…and bacon has NONE…. Where are all those carbs coming from?? I'm figuring about 15 carbs per medium sized carrot…and about 4 carrots per serving…60 carbs per serving? ANYWAY…these look INCREDIBLE…and yes, I will be serving them for Thanksgiving this year! How cow! I am totally craving this now! Delicious! I used 1/2 carrots and 1/2 parsnips. I used maple syrup for the carrots and ginger syrup for the parsnips. Served with roasted cider brined turkey. Vee C: I'm glad you liked them and the parsnips in ginger syrup sounds amazing! Oh my goodness! You found a way to make eating bacon HEALTHY! I loved this. I must have eaten… well, I ate a lot. These are absolutely delicious! I'll be sending lots of friends and family your way. I'm looking forward to trying more recipes of yours. Thank you for a deliciously evil way to eat carrots. This recipe failed completely! I'm now adding 15 minutes beyond the time and they are still not soft. I think you'd have to slightly boil these first. There has to be a missing step. Also, I would definitely not waste the maple syrup until the end. It just melts and burns. I experienced the same. 45 minutes is more reasonable. I used the slender sized carrots as recommended and they were more done where the bacon was wrapped, but undone elsewhere. And yes the syrup basting is a waste. I did add it after they were completely done. Ms Prieto: How thick were your carrots?